During Tmall’s “Double 11”（“双11”）festival – probably China’s annual biggest eCommerce shopping festival on November 11,2013 – Moyo ranked highest among the pet supplies retailers in terms of transaction volume over competing Tmall stores Hoopet (operated by Kudi), Garfield (operated by Boqii) and Qpet (operated by Lechong). Based on pricing comparisons, Moyo’s competitors were operating at very significant discounts/losses, while Moyo kept its prices and was able to offer supplier-sponsored promotions to customers, enabling it to maintain its gross margins. 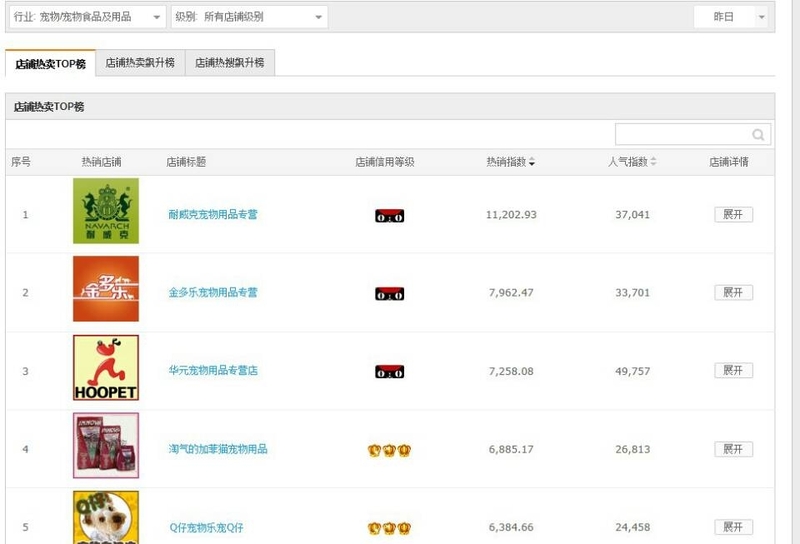 (Picture shows top Tmall stores in the pet category; Navarch, a pet food brand, is ranked #1 due to bulk purchases made by distributors and wholesalers; Jinduole (operated by Moyo) is ranked #2 above the other competing retailers).